I haven’t actually blogged about my own knitting in a while, so I thought I’d take the time to show you folks what I’ve been up to the past few weeks. This is the back of the baby jacket I was talking about a short time ago. Since I took this picture this afternoon, I’m almost up to the shoulders! Another pattern repeat and I can put it on a holder and start the fronts. The tweed is white/grey/black, so when I showed the beau my new yarn he thought I had accidentally dropped it in some lint. It’s looking fine knit up, but next time I’ll be sure to go for colourful tweed to ensure it doesn’t have that rolled-in-the-sandpit look. 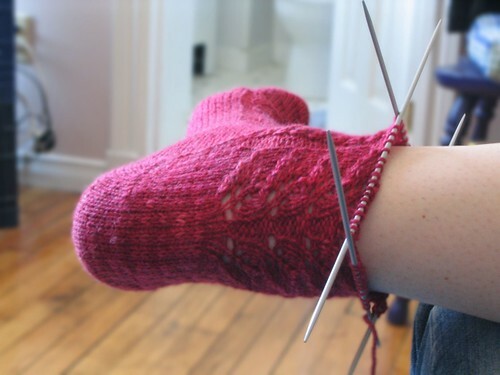 I love how the pattern is broken up by a short bit of ribbing. The transition into and out of the ribbing sometimes turns a purl into a knit, of which I’m not a huge fan. I was going to modify it with some twisting of stitches but then figured it wouldn’t really matter too much and/or pull the cable in weird ways. 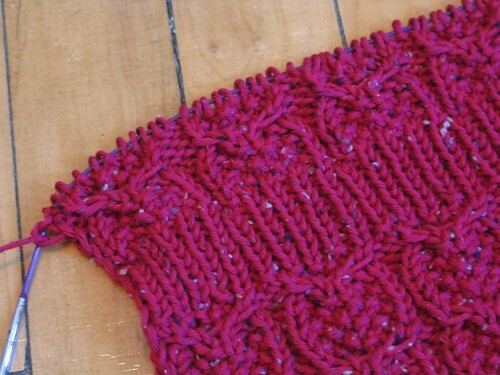 The purl-to-knit transition is actually squeezing the cable, so maybe I’ll make those mods for the fronts. I LOOOOOVE the cast on edge! I decided to do something different and I started with an Alternate Cable Cast-On. 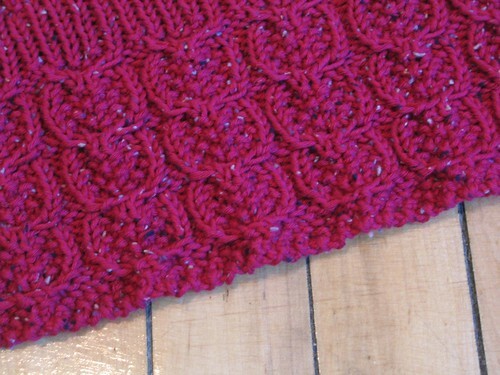 I’m not sure if I did it right, but it provides a beautiful bumpy bottom to complement the initial moss stitch. Oh so cute! I decided to switch the decreases in the lace pattern because I didn’t like the look of it up close. I flipped all right-slanting triple decreases to left-slanting ones, and vice versa. 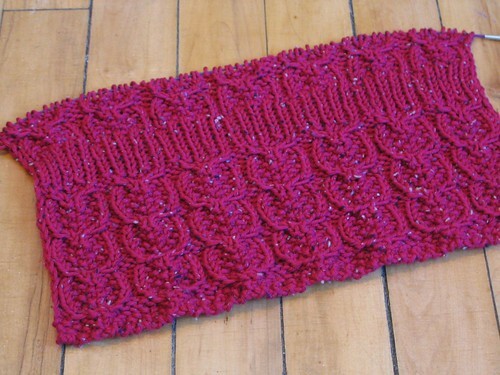 These two projects certainly reflect my taste for over-the-top, swirly lace and cables. And of course the redness! I thought I’d gotten over that by joining project spectrum, but that’s what happens when you knit for Chinese babies and French poets. 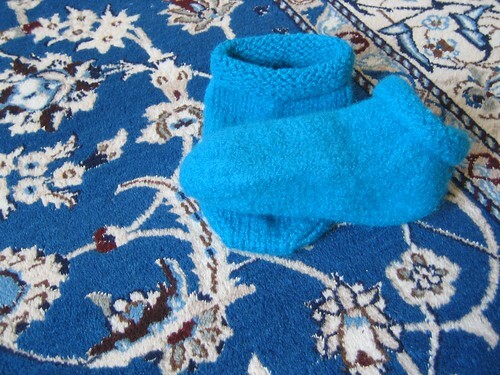 Second-last but not second-least, I’m almost finished with a pair of slippers for my mom. I was knitting them for use around the lab, but then I left them with my mom to be felted and they came out a little small. And by “a little small” I mean they fit her feet perfectly. How convenient! So I finished the second slipper and she’s going to felt that one down to her size as well. What you see in this picture is after the sock was washed once; it’ll need another wash to fully shrink. 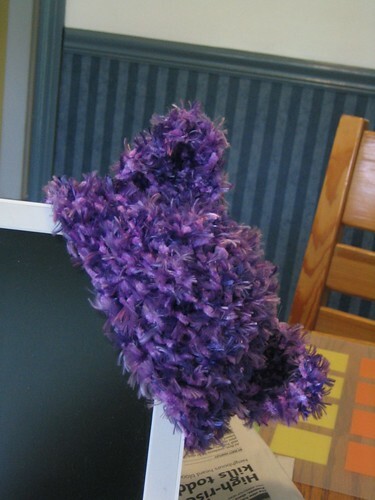 I’m thinking of knitting another pair for myself, this time for wearing at my new lab. I don’t really like the way these ones fit, so I’m going to design them myself. I may even publish the pattern, which was really fun last time. This last little bad boy is an FO; I knit three hats and three pairs of ears in two days a few months ago and I was really excited about finishing them all in two days, but then I never sewed the ears onto the hats because I couldn’t find my upholstery needles. I found them a few weeks ago and put one of them together, but I’m waiting until I get back to Toronto and finished the other two before I make a big post about them. My baby jacket is blocking! Ahha, you do knit! J … and you’ve been hiding it behind the scenes I see. This entry was posted on June 18th, 2007 at 7:41 am and is filed under Baby Clothes, Baudelaire, Hats, Slippers. You can follow any responses to this entry through the RSS 2.0 feed. Both comments and pings are currently closed.